An alarming number of literate people have no idea how to hold their favorite writing instrument. This is partly due to parents and teachers being more concerned with getting the script on paper vs. actually teaching proper holding technique. Sadly, a large number of teachers are also unaware of how to hold a pen. Your thumb, index finger and middle finger create a sort of open triangle. The index finger and thumb don’t need to be closed, however the middle finger does need to cross over toward the thumb a little bit to form a “shelf”. The pencil really rests on the tip of the middle finger while the index finger and thumb prevent the pen from sliding about on this “shelf”. Note how little effort is now needed to hold the pen. The “open triangle”. Note the index finger and thumb really do the writing, while the middle finger just sort of rides along below holding up the “shelf”. While the middle finger creates the “shelf” to hold the pen, the ring finger, little finger and the base of the thumb create the “pad” the hand rests on. It’s your thumb and index finger that actually do the writing by moving in unison while the middle finger sort of tags along under both of them holding the pen up towards them. 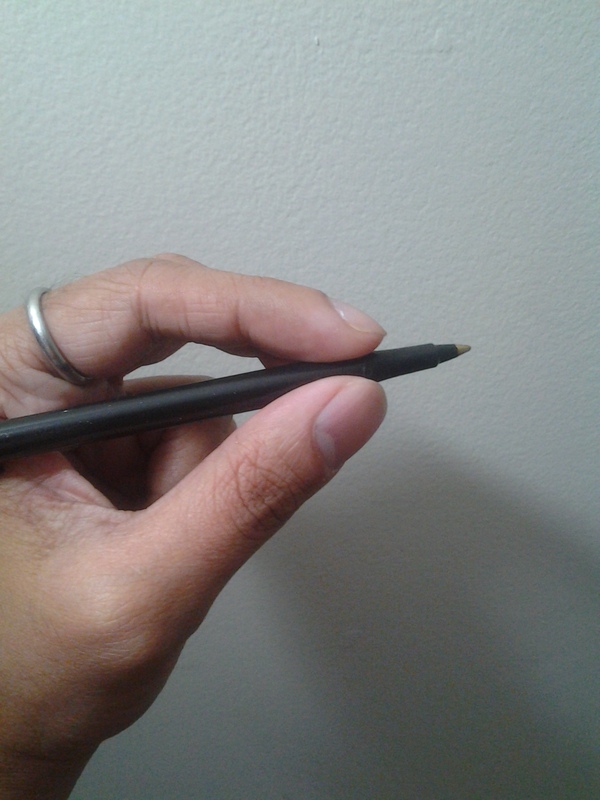 When the index finger has this slight curve, you’re not putting too much pressure on the pen. Remember you’ve got fingers; not a pair of vise-grips so don’t treat them as such. Your ring finger, little finger and the lower part of your thumb create the pad that lets you glide about the paper. This arrangement gives the greatest amount of dexterity when it comes to writing while requiring the least amount of effort. Also, I’ve had juvenile arthritis since the age of 12 so you can bet I’ll look for the least awkward and least painful way to write as long as possible if I can help it. The longer you write, the more tired and strained your fingers will feel if you don’t hold your pen correctly. If you’ve felt tired or your fingers hurt after writing what seems like a short period of time, chances are you’re holding your pen awkwardly. No, but really, what’s the big deal? Everyone types these days. It’s come to a point where handwriting, when it comes to communication, is at about the same level as walking when it comes to transport. People don’t do it because they need to; they do it unless other forms are not available, not applicable or inappropriate. This is a shame, really. Humans are not unique when it comes to complex speech. Plenty of other creatures in this world have far more complex speech patterns in a greater range of frequencies that humans can’t even perceive let alone articulate. We aren’t unique in our concept of culture either. Dolphins are routinely known to hunt with different characteristics depending on the area of their range, even though they may be the same species. Likewise, wolves also exhibit uniqueness from pack to pack. Same species, different behavior depending on community and location. We call that “culture”. The only real difference between us and most other animals is a writing system that lets us pass knowledge from generation to generation. Whereas other creatures are pretty much reduced to chemical secretions when they want to leave a message. In fact, it’s our writing that has allowed us to advance this far and, of course, opposable thumbs helped. Our civilization really owes its existence to writing, not just speech. Now that you have these wonderful tools at your disposal, wouldn’t you want to know how to use them correctly? I’m left-handed, though I usually write with my right hand (unless I’m holding a cup of coffee with my right, or in this case, my phone to take the above pictures). It became really obvious that I’m left-handed when a few years ago I suffered almost complete numbness in my left hand due to the side-effects of a heart medication I was taking at the time. A lot of things suddenly became far more awkward than I expected because… oh right, I used to use my left hand for that. I also recently started learning the guitar and I fear my lack of progress with the right-handed instrument may also be due to me being left-handed in addition to the shortage of free time. When I was in kindergarten, I had an awesome teacher; probably the best I’ve ever had. In many ways she’s the reason I am who I am today and was really responsible for cultivating my curiosity and a tenacity when it comes to satiating it. That aspect has stayed with me to this day, but unfortunately, she had a not so awesome assistant. Despite me being left-handed, the assistant, in a not so delicate way, made sure I used the right hand when writing, although my repeated switch to the left should have been a hint. The mere concept of a left-handed writer seemed to have been alien to her and, since I was 2-3 at the time, I couldn’t really mount an effective protest. As a result, I now write mostly with my right hand. This is far more common than a lot of people realise. But she did at least show me how to hold my pencil correctly so I guess I’m grateful for that. This entry was posted in Society and tagged Culture, Handwriting, Learning, Pen, Pencil, Tutorial, Writing. Bookmark the permalink. i have a feeling: every time you write about sth, actually its more than that one thing. interesting. and i like it. you are wonderful! I try and try to hold my pen in one of propwer ways but I just can’t. it’s like the muscles just don’t work that way, I can barely move the pen and the result is a undesphirable scrawl! I was taught the right way (or so my mum says) but at some point have switched to resting the pen on the nail/cuticle of my ring finger, putting my middle and index on the top of the pen and my thumb rests on the index fingers first joint! My thumb wiggles as I write and the ink goes all over my nails…it’s a really stupid writing style! I think maybe your muscles have gotten used to the way you’re holding the pen now. It’s very hard to fix that once you get into the habit, but I’d be more worried about the strain on the cuticle. Over time, it may start to hurt the longer you write that way and might cause discoloration of the nail. You can try slowly moving the pen back to the way it was. It may take weeks or even months, but you may be able to go back to the relaxed style. My fingers hurt if I try to write any other way (I’m old!) Also, I type a lot so I try to put as little pressure on the tips and cuticles of my fingers as possible. I know its well late reply. Just realized my sister holds her pen in an unusual way. Did some googling and basically 2 types are the dominant foundation. The tripod style shown in this article with variations like using the middle finger as a shelf or not. And then there’s quadrapod where someone will rest the pen against the ring finger while middle, index and thumb are used for grip. My sister is this way but variant by having the thumb crossing over the pen lightly creating a different kind of shelf. I use sis as an example because her writing is very neat and fast in all types (caps,lower,cursive) with this bizzare style. Script certainly was/is a huge component in humans development. However the way you hold your inks, in my mind, cant be measured in a best to worse competition when everyones hands are not the same. Hi, I think this is very good article on holding the pen. Just to let you knwo that, I discovered that I am getting pain in my shoulder, finger when ever i write some thing. I have also discovered that I am not properly writing, I am moving my shoulder when I write. My fingers also pain. Can you please suggest what is the better writing method? I have spondolysis that never bothers me except i write or l lift or write. thanks fro your support. U ar a blessing to me. prakash – try supporting your lower arm above the wrist with a towel rolled or folded; experiment with different thicknesses/folds. The idea is to take the responsibility for holding the arm steady away from the arm/shoulder, and allow the soft towel to support your writing. It may help to use an uncluttered, smooth tabletop that allows the towel to move as you move across the paper. This support method may also help mouse users to avoid being fatigued so quickly by the unnatural placement of the hand/wrist that a computer mouse causes. sir, please help me … i am in real trouble of writing properly and handsomely . as while writing my middle finger slips out of the whole fist and weight is transferred to the pen on paper leaving my handwriting all the more ugly…. kindly advise me in this regard..
Second: Relax your hand and shoulder. 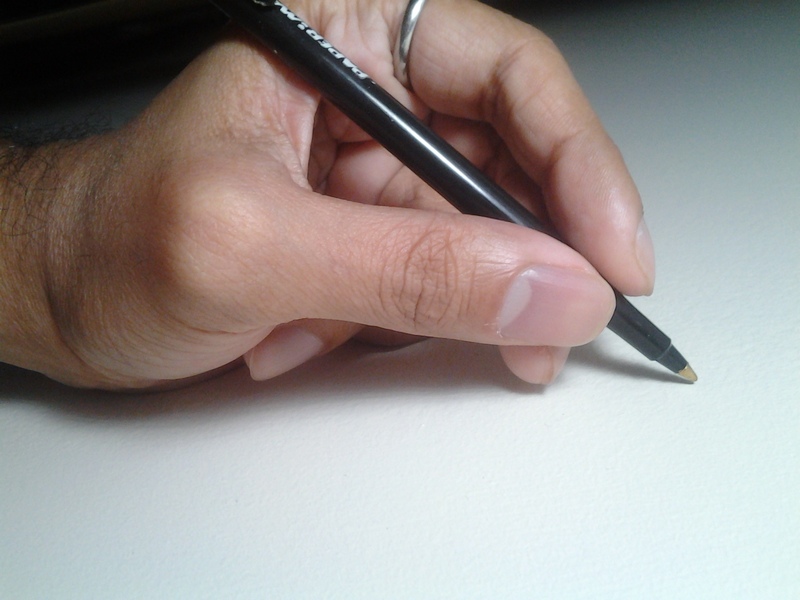 Third: Grip the pen as lightly as possible at first and begin moving it over the paper until you get the ink to transfer. This is the bare minimum needed to write and you can slowly increase pressure on the paper to make the lines bolder. If there are deep grooves on the paper where you have just written, you’re pressing too tightly. I’m also left handed, though I write with the right (thanks to a teacher’s assistant). The right method is the one most comfortable and one least likely to cause long-term strain or repetitive injury. This method works for me and is the least painful since I have arthritis. If your method works, that’s fine. This is the way I find most comfortable and others who have tried it over time say the same. I think maybe you’re putting too much pressure on your fingers and on the paper with the pen. Try using a gel pen or something with where the ink comes out easily so you won’t have to put pressure. A relaxed style with a good pen will help you write longer and avoid pain.. This may be the proper way, but I assure you that it does not necessarily work best for everyone. In school, I was taught to write this way and for years forced myself to write this way because it was the “right” way even though it was painful for me. As an adult I finally decided to give it up and just write in the way that feels natural to me – with my middle finger working essentially as the index finger normally would, and my ring finger filling in for the middle finger. It is so much easier and more comfortable. About 10% of people are middle finger dominant and I bet they would find it more comfortable to write this way too. I have never been able to hold a pen correctly but this has really helped! Hi, actually I am right-handed user previously, but due to injury I have to practice to be a left-handed user. 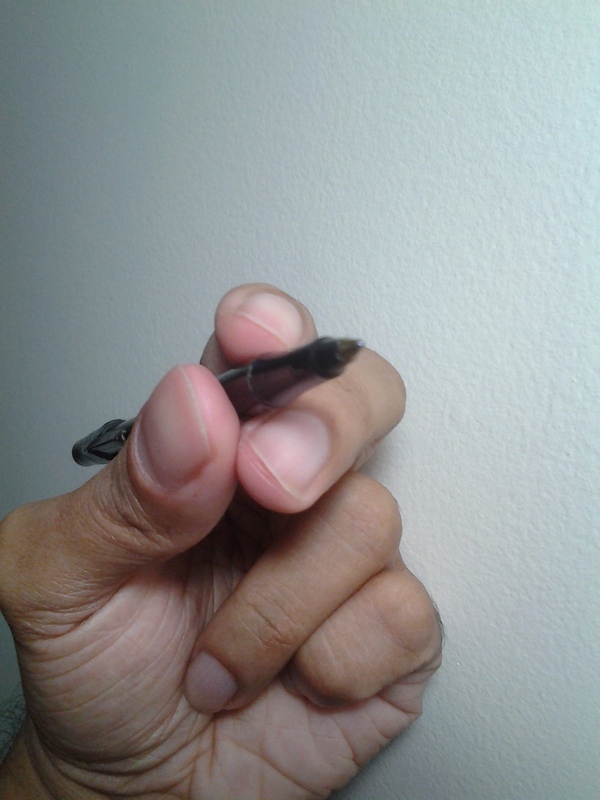 My left hand/finger really ‘like’ your pen-holding gesture. And is it possible for you to share your paper position when writing as well. ^^ TQVM! Way to difficult!!! Trying to write with a pen like this turns out very messy and and is difficult to control, keeps falling/slipping and makes my hand cramp instantly. Ball point pens I don’t think are even made to write this way, they need to be more vertical. I hold the pen as you have told but I get pain in my little finger as I keep on writing. How to control this and why is this happening? I write vertically. Is it better to vertically or slantly(right)? I write with my pinky and thumb..
I’m also looking for a way to hold the pen so that it doesn’t hurt, or do little as possible, due my tendonitis and some pain in my shoulder. I also need write quite often all the day long. That grip is really comfortable for me, I think I can get used to it fast. But when I hold the pen, I turn the pen automatically erect and write mostly moving the pen with my wrist rather than ring finger and thumb, as you said. Do you think this writing style is any bad? Do you thumb and ring finger writing style make any less hurtful to write in my case? Nice article and writing style I like it. it has cheered me up no end. Handwriting culture is being negleted due to modern technology and its a very dangerous trend if allowed to die completely. We need to revive it now. It is a vital tool of communication and expression. There are many ways how we could properly use the pen on how we could lessen the pain in writing many notes. I’m 60years old and I finally get it…. Thanks!